MERCHANT Square in Merchant City, the heart of the Glasgow’s cultural, fashion and food quarter, is all set to raise the roof this weekend when it plays host to The Merchant City Festival’s new ‘Roofless’ programme. Roofless brings an international programme of premieres and new commissions to the Merchant City – all of which are free and outdoors (excepting those held in the renowned Victorian courtyard of Merchant Square). Amongst the festivities planned at The Square throughout the festival are a Friday night Black Bottle Cocktail Challenge; the world premiere of Mischief La-Bas’ Festival of Fudge, celebrating the best of British ‘home-grown’ and local culture, will see performances takes place throughout the Square at various times over Saturday and Sunday; Rolla Paluzzo, a stationary cycling competition, will take place at 6pm on Saturday; whilst Sunday evening will end the festival with a musical performance from The Unknowns. The Square’s customary craft fair will be open from 11am till 7pm throughout the weekend and expand outside to include stalls along Bell Street and Albion Street. Topping 70,000 attendances over four days last year, organisers are celebrating the Festival’s tenth anniversary with its most ambitious programme yet – incorporating 130 events across 54 venues under various strands, including dance, music, street arts, theatre, visual arts, comedy and sport. 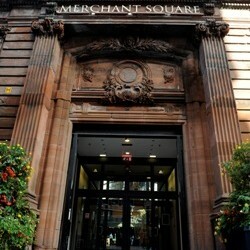 Merchant Square is Glasgow’s most vibrant venue for a worldwide selection of cafes, bars and restaurants, including: Bar Square; Beer Café; Sizzlers Steakhouse & Ocean Grill; Fanellis; Metropolitan; Boudoir Wine Bar; Arisaig; O’Neill’s and Mercado. Located on Candleriggs, Merchant Square, once part of the old Glasgow Fruit Market, is imbued with the history of the area’s dominating Victorian architecture, although today this sense of history blends seamlessly with the distinctly cosmopolitan ambiance that pervades the surrounding cobbled streets that bring the outside in.